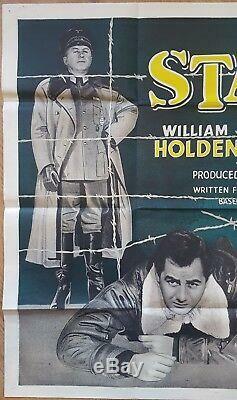 Stalag 17 (1953) UK quad movie poster. British Quad (30" X 40"). Billy Wilder delivered one of the best World War II POW films with this picture that he produced, wrote and directed. And as director, Wilder would receive a nomination for an Oscar while star William Holden won Best Actor. The story centers around Holden's character who is suspected of being a mole for the Nazis - until Holden discovers who the real traitor is among them. This British quad is a scarce find and features the prison camp's threatening barbed wire fence superimposed over dramatic images of the film's key players. One pin hole to each corner. Please check out our other movie & entertainment memorabilia! 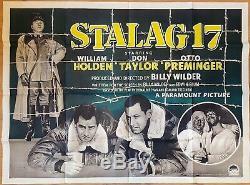 The item "STALAG 17 (1953) British quad movie film poster World War II classic cinema" is in sale since Friday, January 5, 2018. This item is in the category "DVDs, Films & TV\Film Memorabilia\Posters\Originals - UK Quads\Pre-1970". The seller is "london_collectibles_limited" and is located in Chessington. This item can be shipped worldwide.